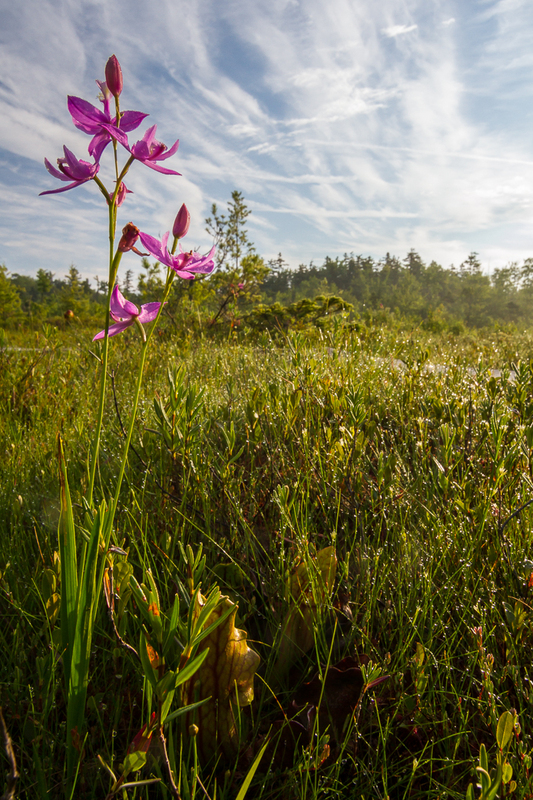 Wide view of the dew-covered Hawley Bog with pitcher plants, bog rosemary, and grass pink (or Calopogon) orchid visible. While attending the NECCC at UMass and doing some night photography, I was also able to sneak away for a morning of nature photography at Hawley Bog. Hawley Bog is a unique well-preserved New England bog complex, jointly owned and managed by the Nature Conservancy and the Five College Consortium. Bogs are one of my all-time favorite habitats; full of exotic plants and often a somewhat exotic northern-type avifauna. Plus, how cool is it to feel the ground shake beneath your feet like jello? 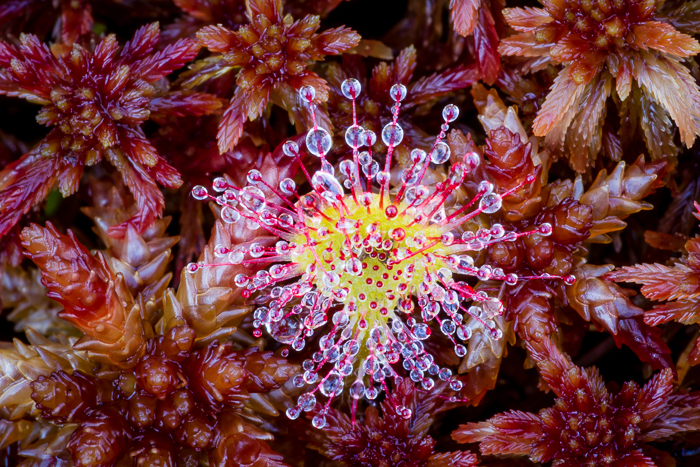 A round-leaved sundew leaf emerges from the mat of Sphagnum moss. The glistening drops of fluid attract and trap insects which are then digested through enzymes. Acidic bogs are poor in nitrogen and other nutrients, thus you find many carnivorous species of plants which trap insects to provide necessary nutrients they can't extract from the soil. Hawley bog is host to round-leaved sundew (Drosera rotundifolia), purple pitcher plants (Sarracenia purpurea), and horned bladderwort (Utricularia cornuta), all carnivorous species. 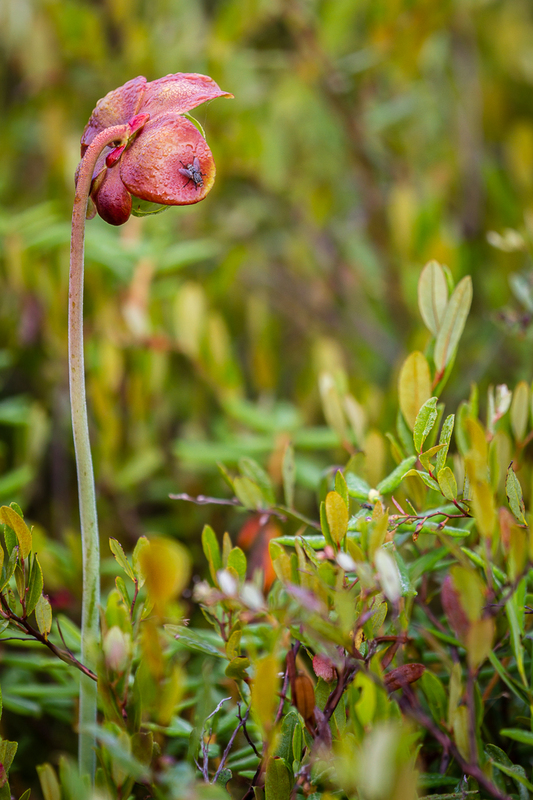 The flowers of purple pitcher plants rise above the surface of the bog like funky umbrellas. This flower playing host to a fly. 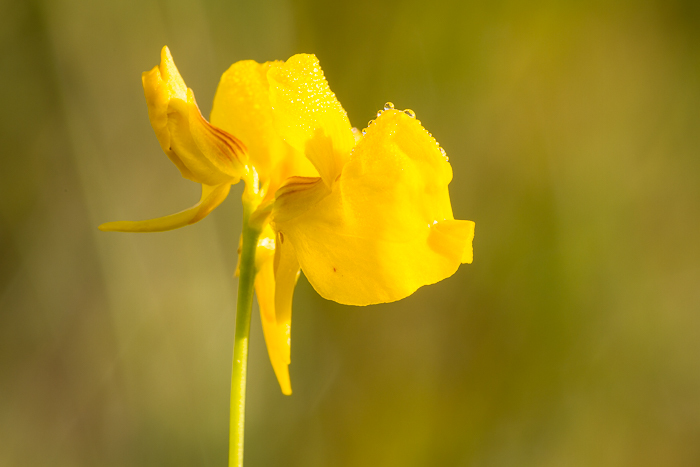 The flowers of horned bladderwort are quite striking in their own right. The leaves of this plant contain tiny bladders which trap very small invertebrates. 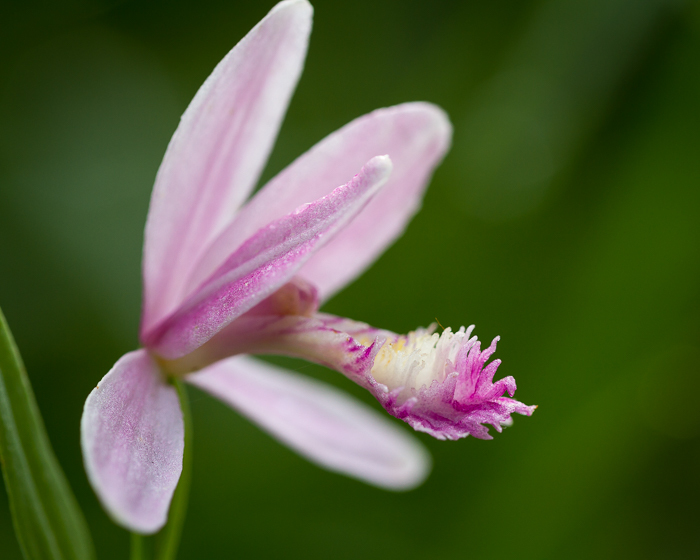 In addition to the carnivorous plants, Hawley Bog also hosts several species of bog orchids. Another group of plants that are just as fascinating and beautiful in my mind. 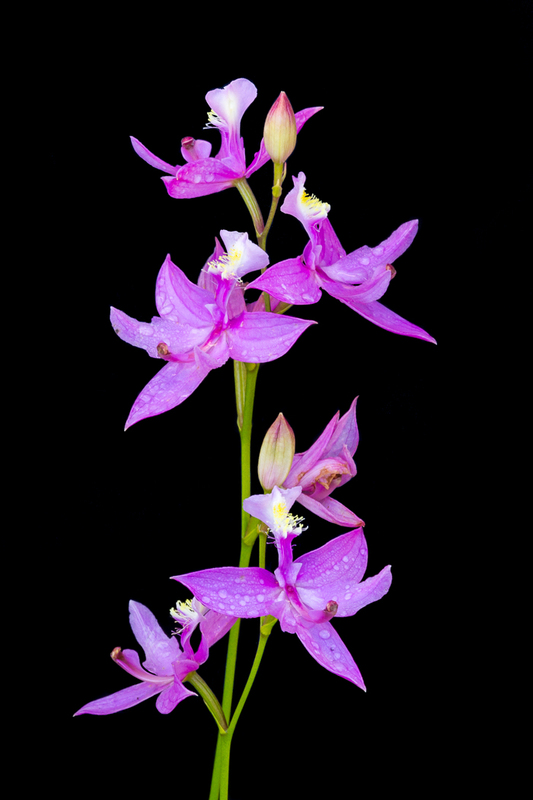 Grass pink orchids (Calopogon tuberosus) are perhaps my favorite species of orchid. Beautiful and associated with the fairly rare bog habitat. 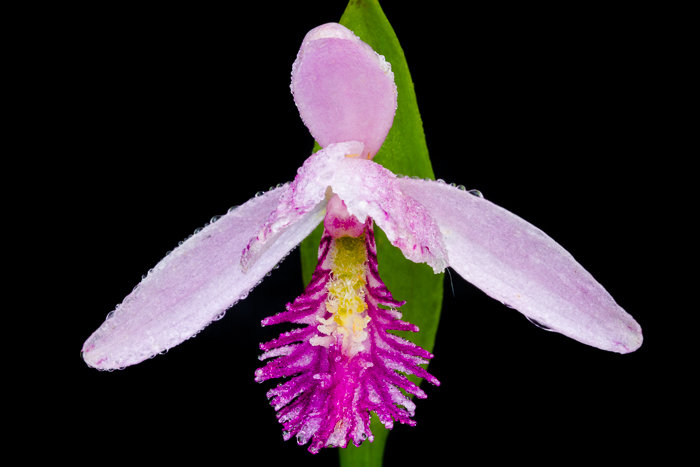 Rose pogonia (Pogonia ophioglossoides) is another beautiful pink orchid commonly found in bogs and fens. Rose pogonia (or snakemouth orchid) from the side. 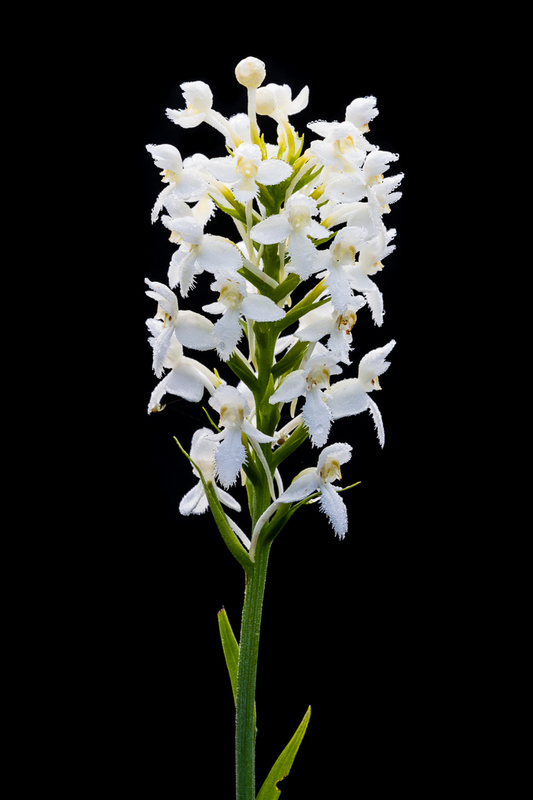 Although I don't associate it as much with bogs as the previous two species, white-fringed orchis (Platanthera blephariglottis) grows out on the Hawley Bog and blooms slightly later in the summer than the other two species. Luckily this plant was farther along than most of the other specimens. Finally, around the edges of the bog grows yellow loosestrife or swamp candles (Lysimachia terrestris), a wetland indicator plant. 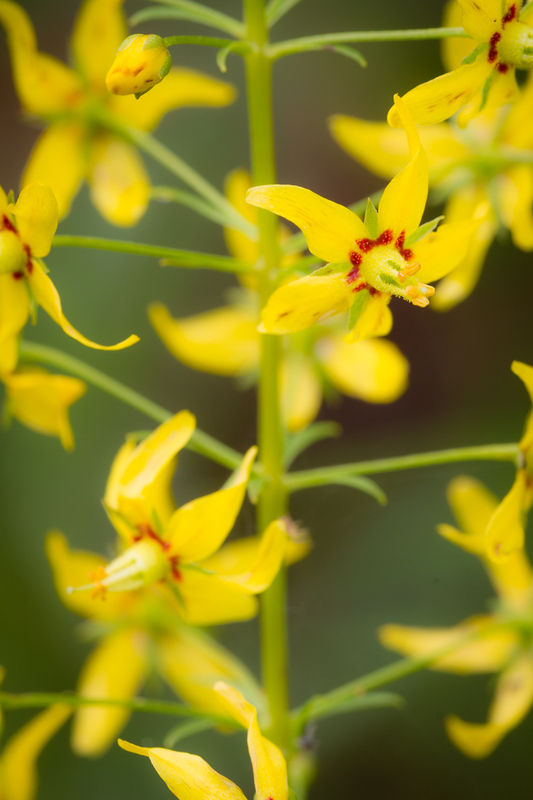 As a young birder, I used to love yellow loosestrife because of its beautiful yellow spike of flowers, making it easy to identify, and its apt and poetic alternate name, swamp candle. Swamp candles add their bright flame to the wetland complex. Yellow loosestrife is the only local yellow-colored loosestrife species that doesn't have leaves obscuring the yellow flowers. Great photos. Nice to have so many in bloom for your visit. Thanks Ray! Yeah, lucky timing on the blooms. I wasn't sure what I was going to get.